Popular Nollywood actor, Muyiwa Ademola has just been blessed by a pastor for a movie he shot 14-years ago. Apostle Tope Onileowo of Rock of Prayer Christian Centre in Houston TX recently watched Muyiwa Ademola’s movie titled, ‘ORI’ four months ago, and ever since then has been looking for the actor to gift him certain amounts of Dollars. Upon sighting the actor days ago, the Apostle not only gave him the Dollars which he has been carrying on him for months but also topped it with a brand new car. 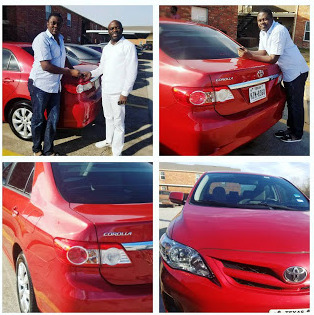 Muyiwa took to social media to thank the pastor with photos of the ride.